This Locally Grown Field Guide is designed to introduce several key concepts from social scientific and communication research and to motivate each other to engage in meaningful and productive relationships and projects that will spur positive change in our community and local food system. The selection of the specific concepts is based on our current culture in relationship to attitudes, values, beliefs, and behaviors toward each other, food, the planet, the economy, and the political climate. This Field Guide introduces social science concepts that can guide our efforts to transform our local food systems. As we pursue the important work of preserving the beauty and vitality of our environments while simultaneously cultivating healthy farms, gardens, people, and economies, we will need to call upon many resources. Some are more abstract resources, such as time, knowledge, and memory. Other resources are more physical, such as land, plants, animals, and labor. We hope this guide will provide you with some new ideas to help with our food revolution work. One place to start in changing the status quo is with “opinion leaders.” Communication Professor Dr. Everett Rogers from the University of New Mexico discovered that advances in spreading new agricultural practices and technology in communities are usually led by someone who is more likely to influence others. A person in your community with this kind of power to influence is called an opinion leader and is someone many others in the community know and trust. 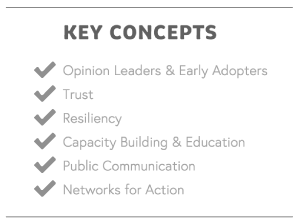 When communities are seeking to change their local food system, whether through the formation of a Food Policy Council, the development of a Food Hub, or helping to build the Food Commons, they should work with opinion leaders in the early stages of a new community food project. Dr. Rogers also discovered that opinion leaders and those who work with them should try to get the message out to early adopters. Early adopters are people in your community willing to try new things. They often have diverse people in their social network, which is an asset in spreading the word. For more on these research findings see Diffusion of Innovations in the Further Reading List. For guidance on starting a Food Policy Council in your community see the Locally Grown Field Guide: Food Policy Councils. In the United States we have created an odd public culture where misrepresentation is part of the social fabric. For example, so-called “reality TV” actually is highly staged and carefully edited. With respect to food issues, “Greenwashing” is designed to fool us about products and services. This widespread norm of misleading public communication seeps into our perceptions and plants fierce seeds of doubt about each other. Rural communities have an advantage here because there are fewer degrees of separation between people and there is a long history in rural US culture of keeping each other accountable. Nonetheless, the profound lack of trust that exists between people in contemporary US society is a poison to our ability to unify, collaborate, and innovate. For true progress in our local food system we need to nurture TRUST. Initiatives and practices such as farmer’s markets, farm stands, farm-to-school programs, school gardens, Community-Supported Agriculture (CSAs), agro-tourism, community kitchens, food banks, and redistribution through coordinated donation of surplus food are just a few examples of the kinds of initiatives and programs communities should come together to create, protect, and expand. By doing these things together communities will start to rebuild a fabric of trust between people, organizations, and sectors of the economy. Resiliency is the ability to “bounce back.” Resiliency is crucial at both the individual and the community level. Individuals involved in food issues sometimes suffer from “burnout” when, on a daily basis, we face stubborn obstacles and barriers. For example, the number of poor and hungry people in the world does not seem to diminish. Self-care is one way for an individual to build resiliency. Another way is to work with others to achieve local successes. Rebuilding meaningful political and reciprocal exchange relationships with others in your community is an essential part of increasing our individual levels of resiliency because we have broader networks of support in times of setback or crisis. On another level, scientists are finding that resiliency is going to become more and more important in the coming decades as the earth’s atmosphere becomes increasingly destabilized resulting in widespread and unpredictable weather systems and patterns. Our food systems have already and will continue to undergo major economic and ecological impacts and adverse effects from these changing environmental conditions. The environment (such as our soil) has built-in strength and resiliency, but may need our help. At the very least we can stop harmful practices. For example, Rachel Carson’s book, Silent Spring, helped to accelerate the movement away from DDT, thus enabling plants and birds to bounce back. When was the last time you got out into your community and attended a public lecture, workshop, meeting, or symposium? In order to build the communities we want and create more equitable, ecological, and economically robust local food systems, we will need to become more receptive to learning from each other. We need to create learning communities and learning organizations. This is true at both the receiving and the giving ends of the spectrum. We need to open our hearts and minds and become more receptive to learning from our neighbors and local experts. On the other end of the spectrum, it will become increasingly important to become more generous with our time and knowledge, sharing it voluntarily with those in the community who could benefit from it. Cross-sector collaborations in this regard can be particularly powerful. For example, communities could establish an annual or biennial food summit, as well as a healthy menu of place-based learning through sustainability education centers. Any successful effort at bringing about desired change is going to rely on education, both traditional and non-traditional. Education on food issues can range from basic knowledge about agriculture and nutrition to more advanced understandings of complex food systems. The challenge for food advocates is to motivate learning from the heart. It will be critical to demonstrate that food issues are relevant to the learner. For more specific education recommendations see Locally Grown Field Guide: Food Education. Younger generations are demanding more transparency and less power difference between people in organizations. Increasingly diverse racial, ethnic, and gender identities are the present and future of our communities, our country, and our planet. Climate refugees will become more common. Changing attitudes and policies on immigration will affect the nature of migrant farm labor. These kinds of changes to the landscape of our families, professional lives, and community engagements will require changes in the way we think about public communication. More advanced and accessible communication technology has allowed more interaction between diverse contacts and perspectives. We all have a responsibility to participate in the public life and this means more opportunities to plan and share messages regarding the kind of transformation we want to see and bring about in our communities. Gone is the time of passive consumption of consumer goods and public messages. It is time for all of us to channel our creative energies into producing and innovating for the well-being of our loved ones. As our food systems become more decentralized and community or bio-regionally based, we will need to find new ways to create food messages that will benefit each other. Social Media no doubt will play a significant role in public communication about food, but we will need to move beyond “selfies” with a plate of food in front of us or television shows about exotic and strange foods that people in different parts of the world consume. For example, we could use Social Media to help create local seed exchange networks to preserve heirloom varieties of locally adapted fruits and vegetables. Together we can! As we engage more with our communities and participate in creative projects to transform our local food systems, we should always have the idea that we are involved in the essential work of increasing our networks for action. Together in community we can increase the capacity to welcome diversity, be more resilient to setbacks or crisis, and rekindle trust that has decayed. Together in community we can generate value through giving and receiving, promote learning from the heart, communicate more transparently on equal terms, and learn from each other the good work of transforming our food systems. Working in community via networks will make these goals become easier and more natural. Let us keep this community focus while we are in the middle of a full-on revolution in the way we think about, represent, grow, distribute, process, store, exchange, consume, and compost food. By continuing this work together, we will find it more and more important and feasible to become food-system change agents for the health of ourselves, our families, our communities and our planet. Embedding food studies into education across the board. Rolfe, B. (2005). Building an Electronic Repertoire of Contention. Social Movement Studies 4: 65–74. Tarrow, S. G. (1998). Power in movement: social movements and contentious politics. Cambridge University Press. Thoreau, H. D. (1903). On the Duty of Civil Disobedience. London: Simple Life Press. Tilly, C. (2003). The politics of collective violence. Cambridge University Press. Rice, R. E. (2009). Diffusion of innovations: Theoretical extensions. In SAGE handbook of media effects. Edited by Robin L. Nabi and Mary Beth Oliver, 489–503. Thousand Oaks, CA: SAGE. Pretty, J. N. (1995). Participatory learning for sustainable agriculture. World Development 23: 1247-1263. Garvin, D. A. (1993). Building a learning organization. Harvard Business Review. Chenoweth L., and Stehlik, D. (2001). Building Resilient Communities: Social Work Practice and Rural Queensland. Australian Social Work 54: 47 – 54. Hopkins, R. (2008). The Transition Handbook. White River Jct: Chelsea Green. Jianchu Xu, Meine Noordwijk, Jun He, Kwang-Ju Kim, et al., (2012). Participatory agroforestry development for restoring degraded sloping land in DPR Korea. Agroforestry Systems 85: 291 – 303. Kulig, J., Edge, D., Townshend, I., Lightfoot, N., and Reimer, W. (2013). Community resiliency: Emerging theoretical insights. Journal of Community Psychology 41: 758 – 775. Leykin, D., Lahad, M., Cohen, O., Goldberg, A., and Aharonson-Daniel, L. (2013). Conjoint community resiliency assessment measure-28/10 items (CCRAM28 and CCRAM10). American Journal of Community Psychology 52: 313 – 323. Orr, D. (2009/2011). Down to the Wire: Confronting Climate Collapse. UK: Oxford University Press. Walker, B., & Salt, D. (2006). Resilience Thinking. Washington D.C.: Island Press. Alessandri, G., Vecchione, M., Caprara, G., and Letzring, T. (2012). The Ego Resiliency Scale Revised: A Cross-Cultural Study in Italy, Spain, and the United States, European Journal of Psychological Assessment 28: 139 – 146. Hudnall Stamm, B. (2008). Rural Farmers Feed Us All, Journal of Rural Mental Health 32: 1 – 2. Barlett, P. F., & Chase, G. W. (2004). Introduction. Sustainability on Campus: Stories and Strategies for Change. Boston: The MIT Press.